11 Rue Dalpozzo, 06000 Nice, France. It fits in with relative discretion to the street-scape and it’s only the presence of multi-national flags that give away the fact that you’re in the presence of a hotel. Like someone adjusting your eyes walking into a darkened room from a bright exterior, you quickly see that it’s not that discrete a presence after all and wonder how you could have missed it in the first place. Stepping inside gives the initial impression of a sanctuary from the busy streets outside. There’s an immediate sense of a successful fusion of the traditional and the avant-garde, with the oak-panelling in the bar and the check-in desk contrasting alluringly with the funky reception area and the window to the back garden beyond. Orginally built during the Belle Epoque years of 1895/96 by a student of the Gustave Eiffel school, it bears the architectural hallmarks of the era, including the cut-stone façade and the iron roof structure. At first it was a private home but was soon transformed into a hotel (presumably after the owners started to get their first maintenance bills). Tourism from Britain had taken off by then and many English guests like to spend long periods on the sunny Côte d’Azur in winter. In the tradition of the times and in a nod to the importance of the British market, the hotel was rechristened after the British royal family name. By the 1940s, however, the owners decided to take the atmosphere and feel of the hotel in a different direction. Drawing on the notion of exotic travel, the stunning back garden was conceived around a swimming pool as a haven from the city but also from the standard interior hotel design. Flavours of the Orient were introduced then that still give the place an Eastern zen je-ne-sais-quoi. Around the same time, they brought art into the Windsor and it is this that gives the hotel a funkiness that makes it a refreshing place to stay. British sub-royalty were regulars in the early days and in recent years, many rock stars and artists have been drawn to the hotel for obvious reasons. There is surely a room for everyone in this hotel as they are all different and different artists had the pleasure of designing each room. 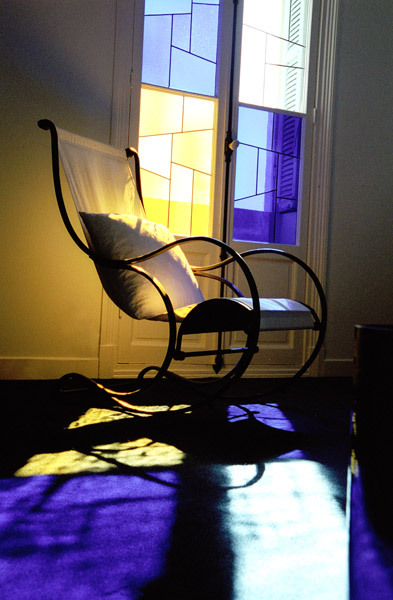 We stayed in the Matisse Room by artist Jean le Gac. A place to lay your head and give you dreams of colourful simplicity, the whites, cobalt blues and yellows are at their best in the morning when the streaming light through the stained glass windows imprints an image on your mind that will last long after you’ve returned home to dear old Ireland. Or why not try the “Ben” room? The Niçois artist Ben Vautier has cut a name for himself with his unique writings and musings in his unique writing and his room – covered in his trademark script – is a unique experience. There are about 20 chambres d’artistes in the Windsor at any given time, with new ones replacing old ones every year. Depending on the time of year, you can eat either in the Wi Lounge or the Wi Jungle. One is in a cosy dark-wood lounge by the fireplace and the other is served under a giant rubber tree in the tastefully tropical garden. The cuisine is solid and with the flavours of local fish and herbs. Prices in low season start at €105 per night without breakfast. Check the website for further details and deals.